Talking of new issues of magazines, my Simply Knitting also arrived this week. The jumper featured on the cover is a wildly vibrant orange bobbly cabley thing, which would lift your spirits every time you wore it, were it not for the rather unfortunately placed bobbles on the chest! Finally, I know a few people have had trouble leaving comments since I switched to Blogger Beta. I've found this to be one of the main drawbacks (it also means that I can't leave a comment on a blog which isn’t using Blogger Beta), although I suppose that these snags will disappear once the new version has reached everyone. In the meantime, you can always leave a comment as "Other", entering your name and blog URL manually. Bit of a pain, I know, but I hope it won't be long before everyone can switch to Beta. 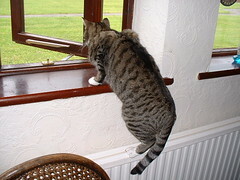 Tigger says, "Don't disturb me, I'm waiting to see what she chucks out next..."
yay! it worked ... thanks for the tip on how to post to beta blogger. What I was going to say (and have been meaning to say for some time - mea culpa!) was just how clever & interesting I thought the construction of the two recently published vest tops was, especially the one formed from the two triangular pieces. thanks for the tip on posting to beta blogger. It works! I love the Tigger photo.